Haystacks is a title of a series of impressionist paintings* by Claude Monet*. 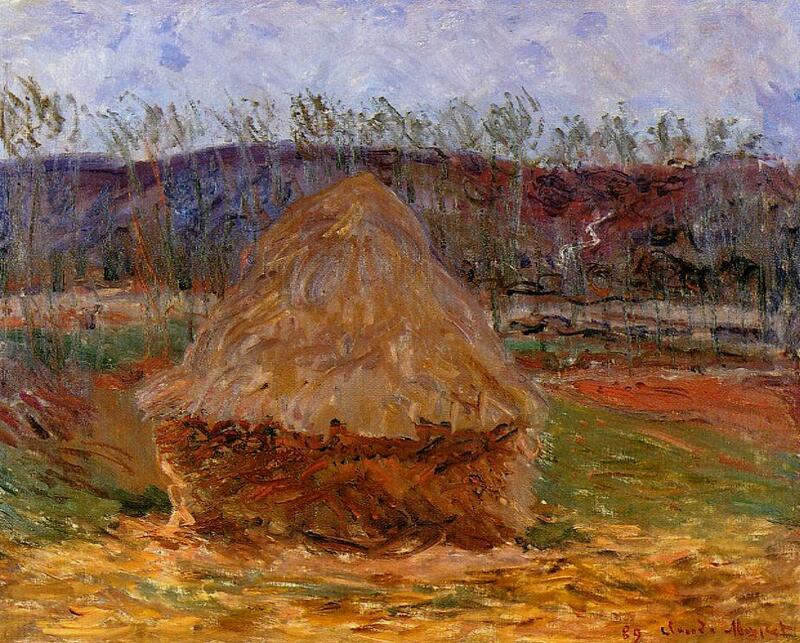 The primary subjects of all of the paintings in the series are stacks of hay in the field after the harvest season. 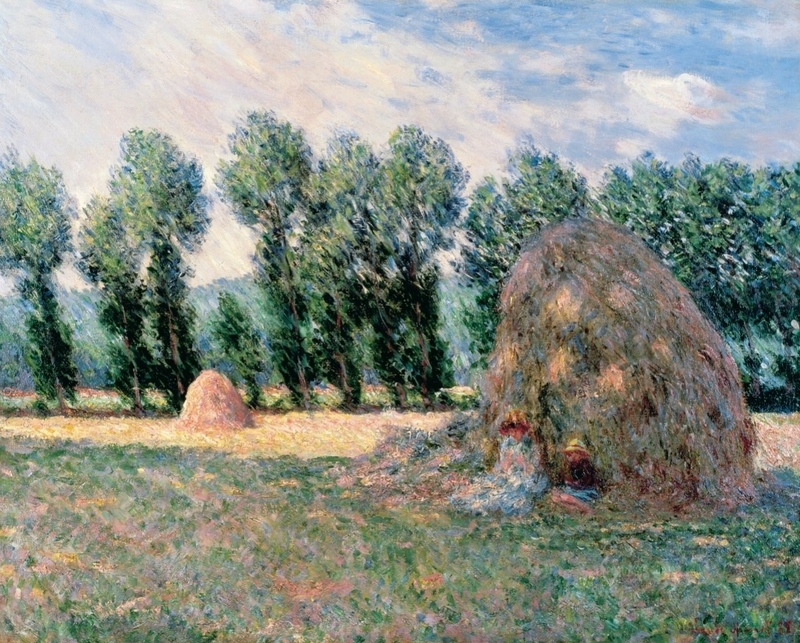 The title refers primarily to a twenty-five canvas series (Wildenstein Index Number 1266-1290) begun in the end of summer of 1890 and continued through the following spring, using that year's harvest. 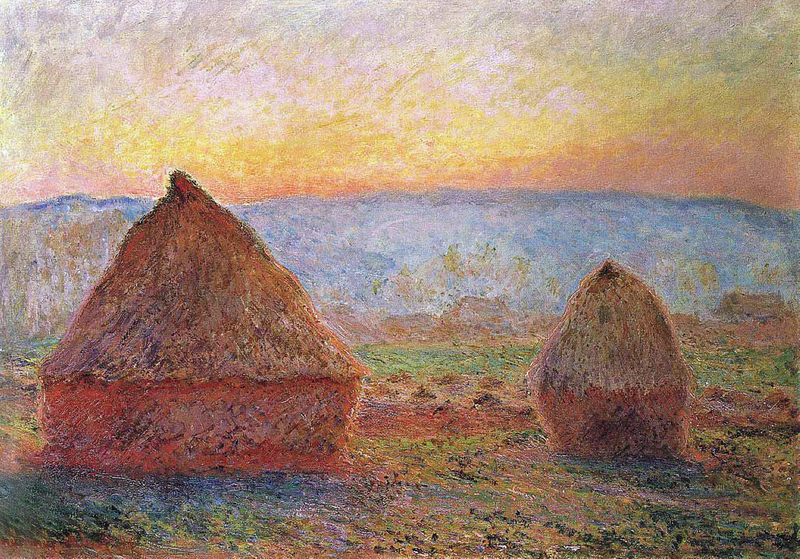 Some use a broader definition of the title to refer to other paintings by Monet* with this same theme. 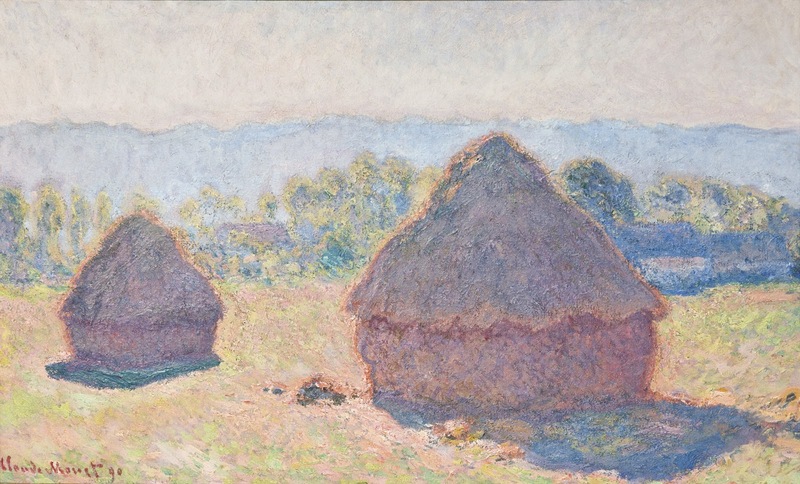 The series is known for its thematic use of repetition to show differences in perception of light across various times of day, seasons, and types of weather. 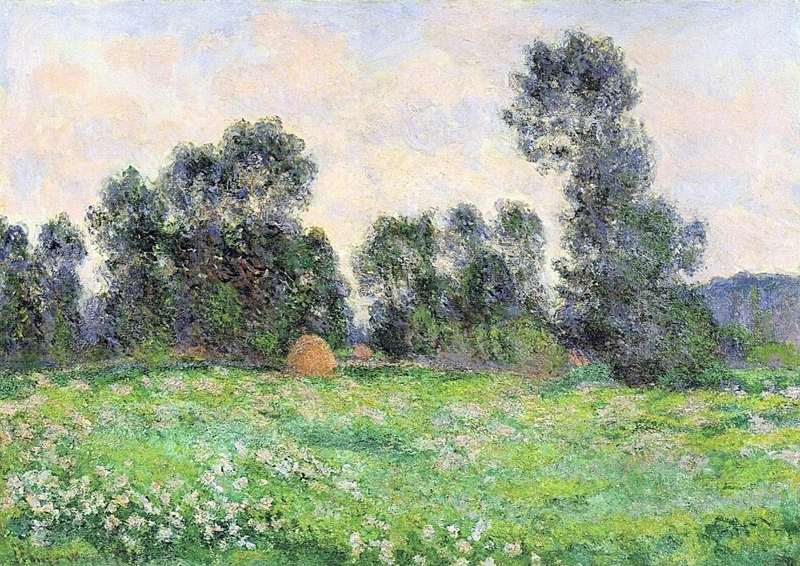 The subjects were painted in fields near Monet's home and gardens in Giverny, France. 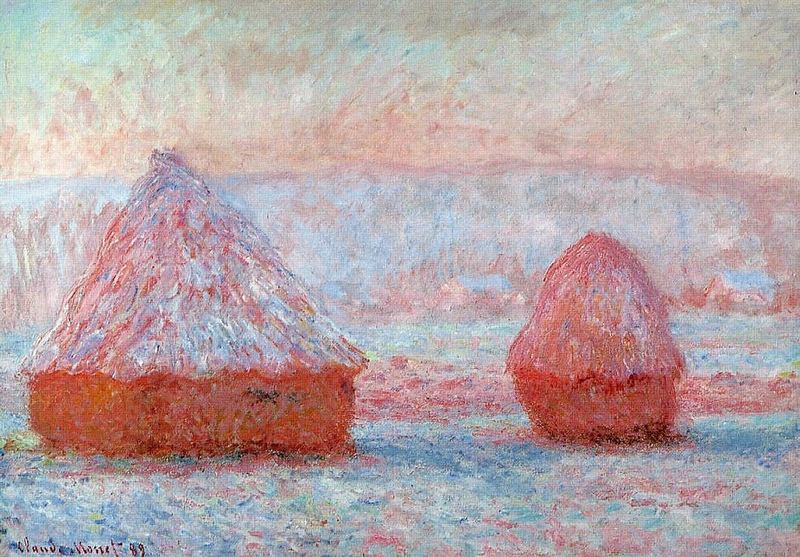 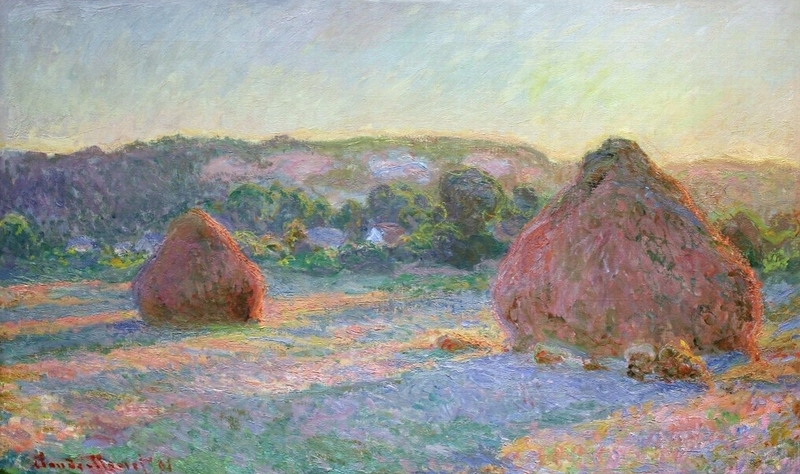 The series is among Monet's most notable works. 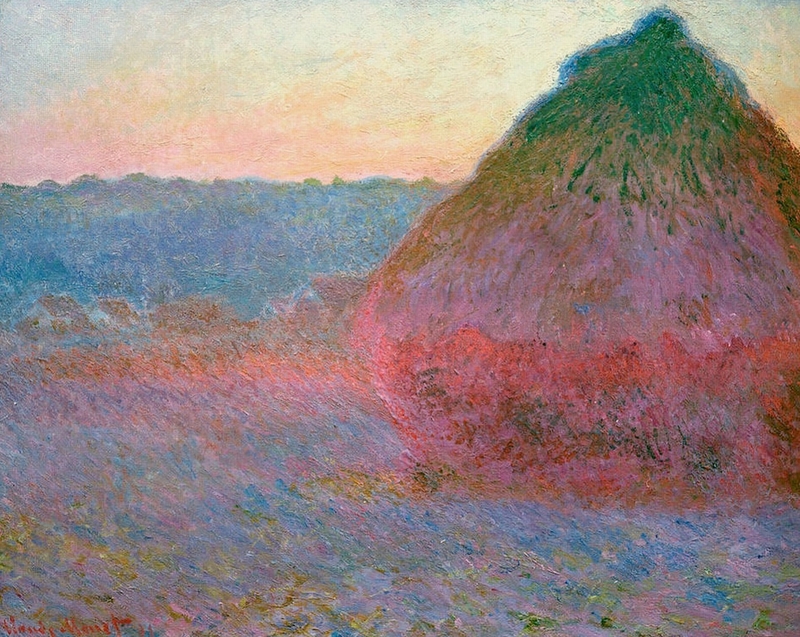 Although the largest collections of Monet's work is held in Paris at the Musée d'Orsay and Musée Marmottan Monet, other notable Monet collections are in the Museum of Fine Arts, Boston, the Metropolitan Museum and Museum of Modern Art in New York, and at the National Museum of Western Art in Tokyo. 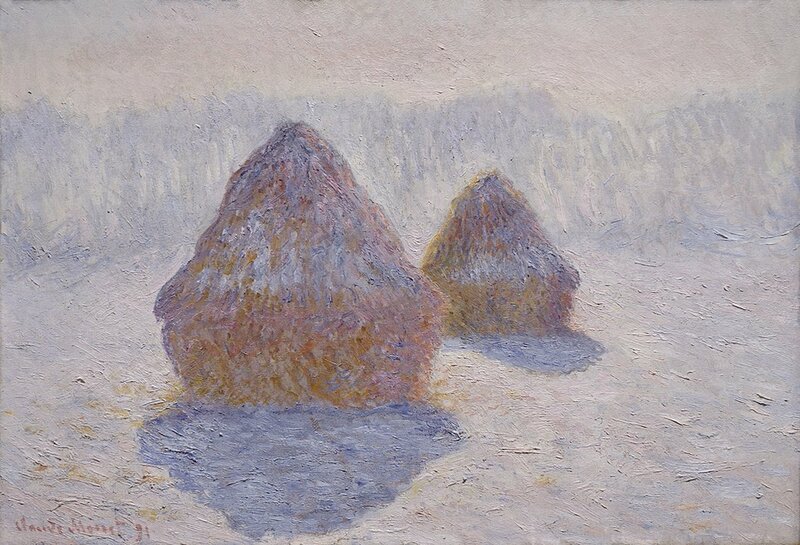 Six of the twenty-five haystacks pieces in this series are currently housed at the Art Institute of Chicago. Other museums that hold parts of this series in their collection include: the Getty Center in Los Angeles, the Hill-Stead Museum in Farmington, Connecticut (which also has one of five from the earlier 1888-9 harvest), the National Gallery of Scotland, the Minneapolis Institute of Arts, Kunsthaus Zürich, and the Shelburne Museum, Vermont. 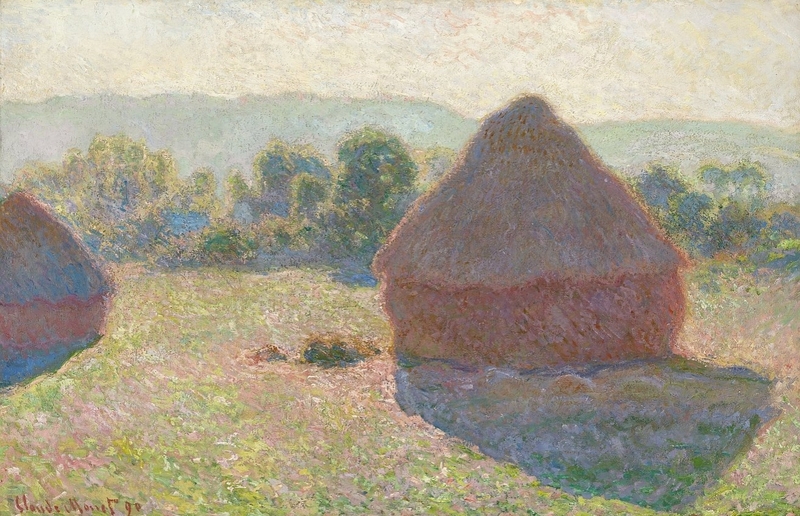 Several private collections also hold Haystack paintings. 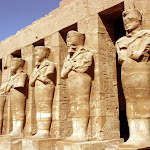 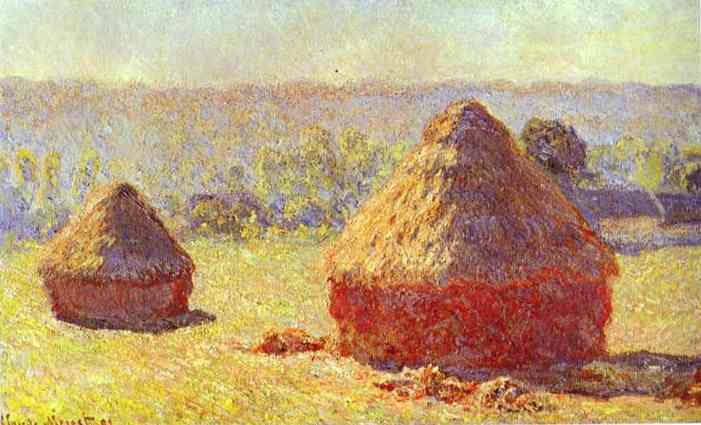 The stacks depicted herein are variously referred to as haystacks and grainstacks. 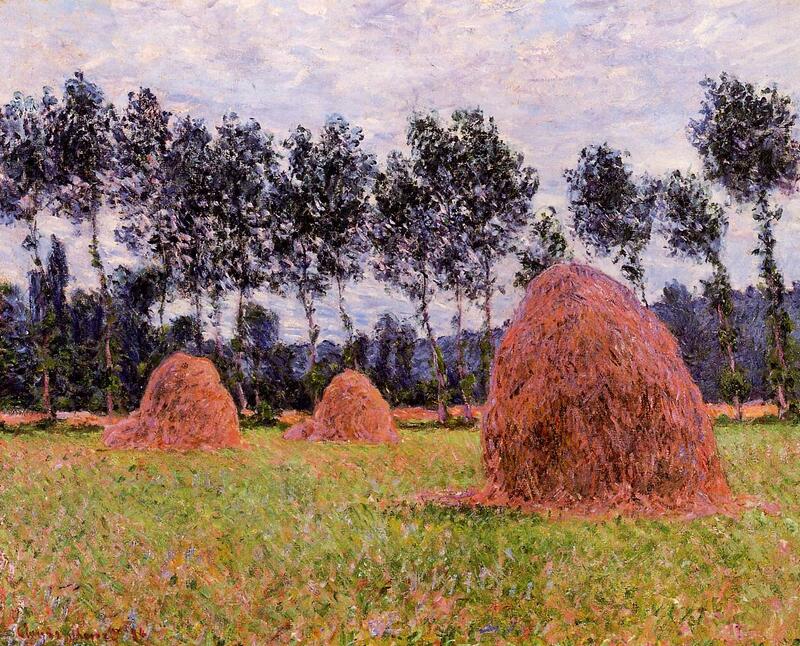 The 15-to-20-foot (4.6 to 6.1 m) stacks were emblematic of the beauty and prosperity of countryside Normandy in France. 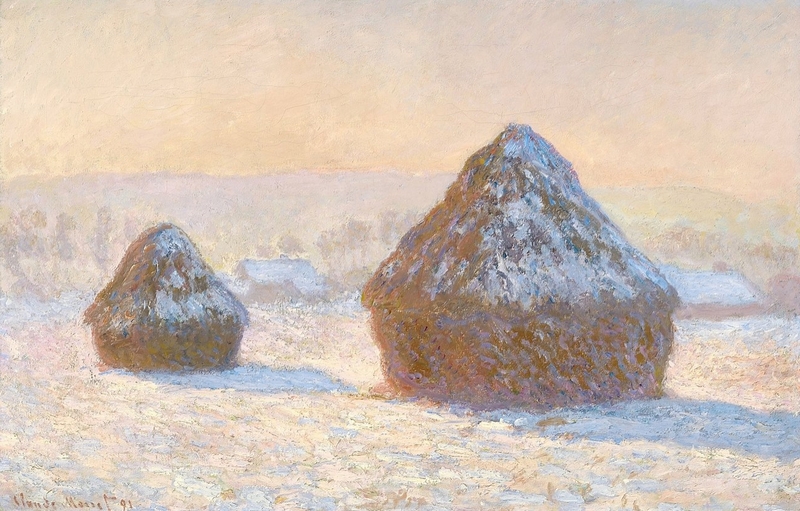 The haystacks functioned as storage facilities that preserved the wheat until stalk and chaff could be more efficiently separated. 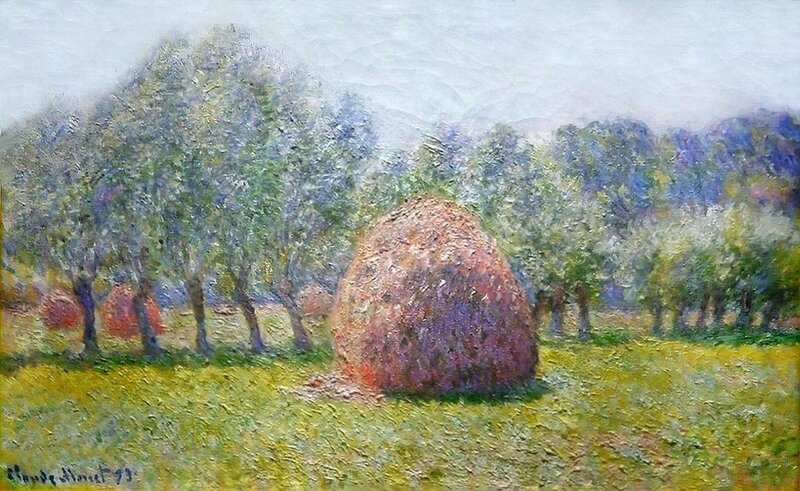 The Norman method of storing hay was to use hay as a cover to shield ears of wheat from the elements until they could be threshed. 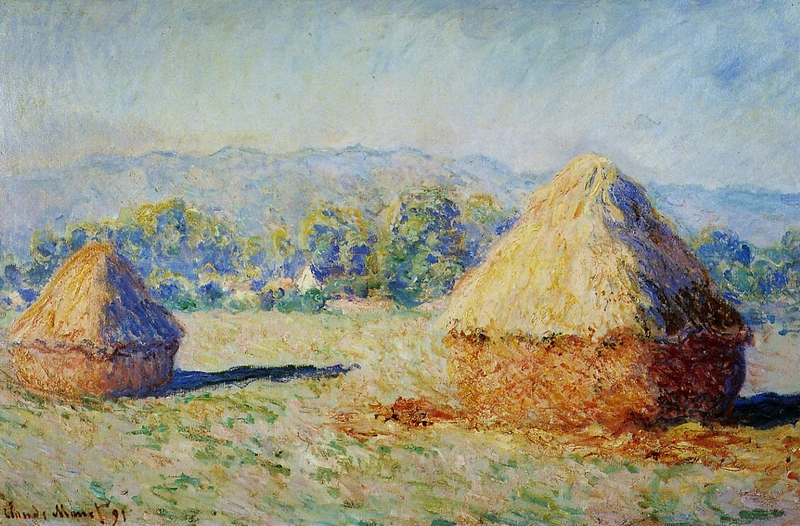 The threshing machines traveled from village to village. 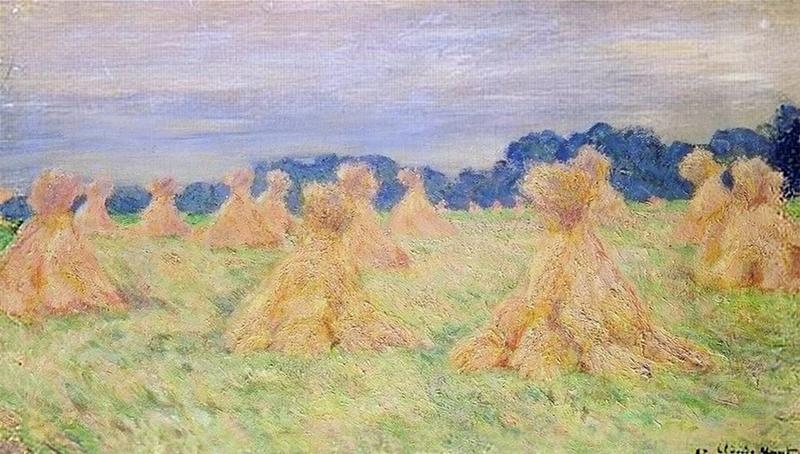 Thus, although the wheat was harvested in July it often took until March for all the farms to be reached. 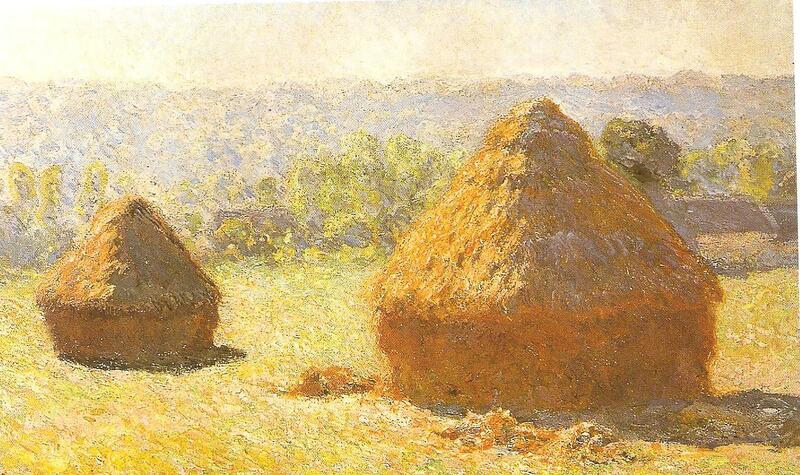 These stacks became common in the mid 19th century. 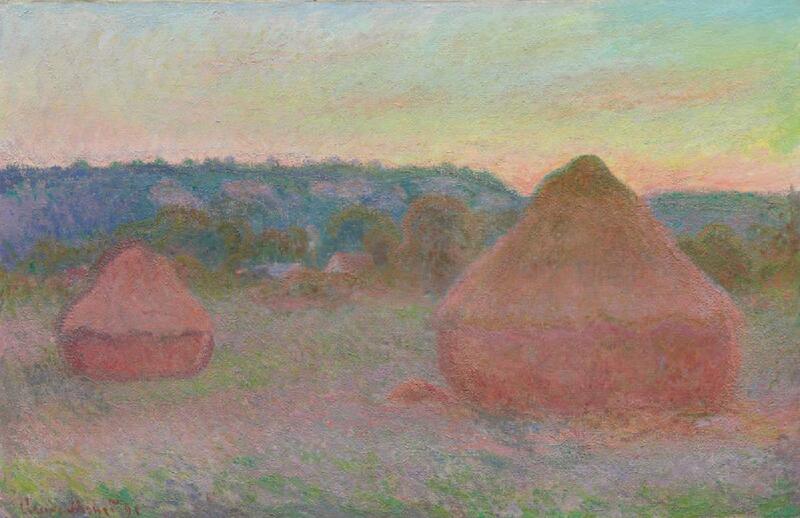 This method survived for 100 years, until the inception of combine harvesters. 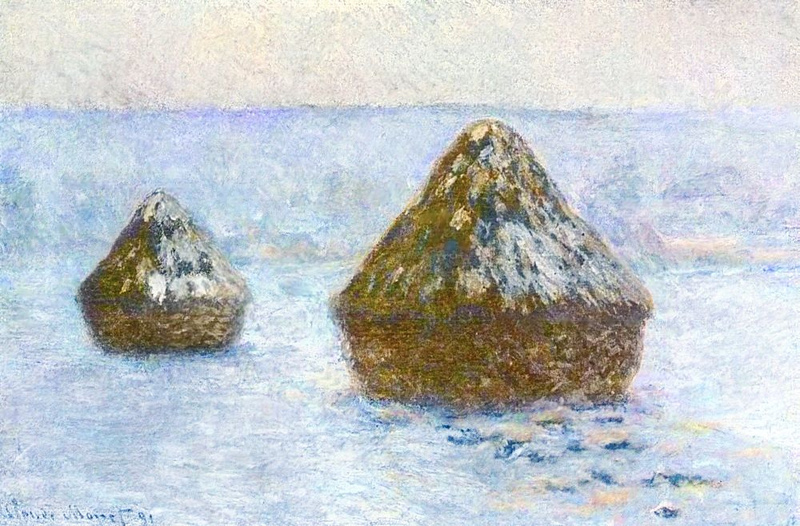 Although shapes of stacks were regional, it was common for them to be round in the Paris Basin and the region of Normandy in which Giverny is situated. 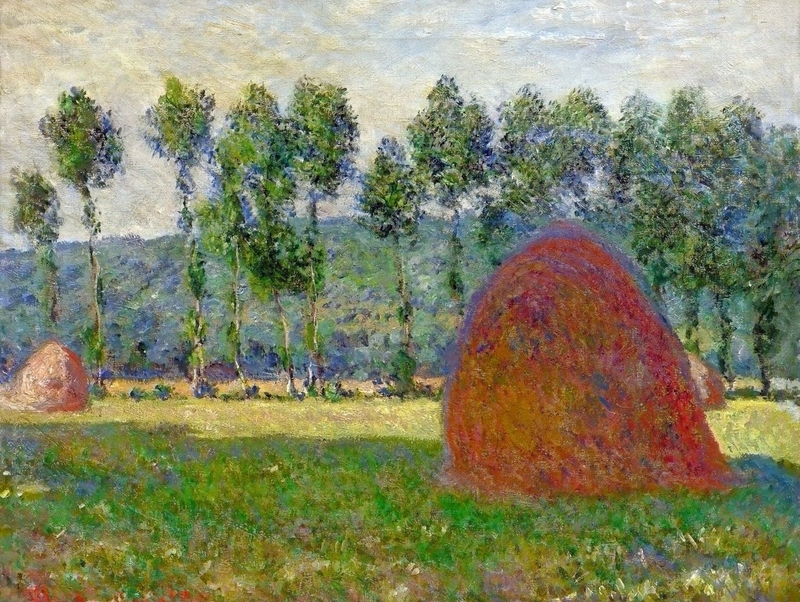 Monet noticed this subject on a casual walk. He requested that his stepdaughter Blanche Hoschedé bring him two canvases. 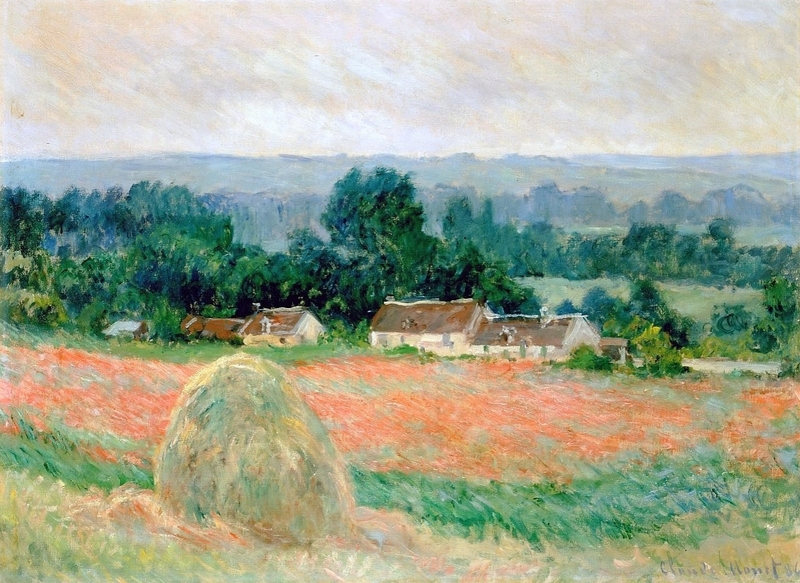 He believed that one canvas for overcast weather and one for sunny weather would be sufficient. 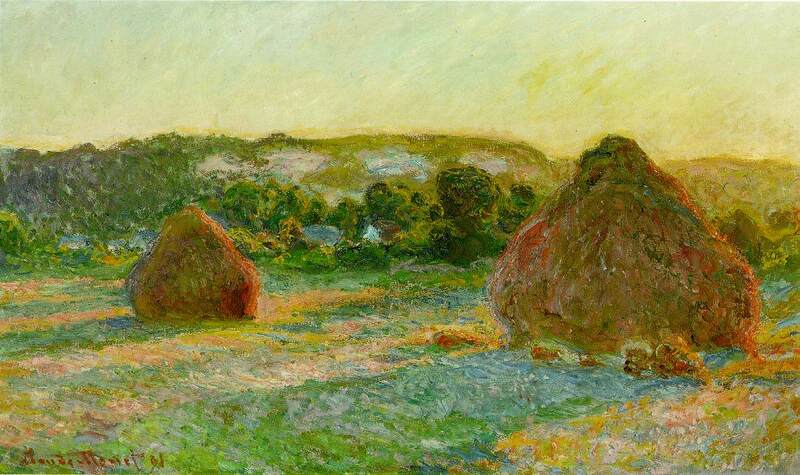 However, he realized he could not demonstrate the several distinct impressions on one or two canvases. 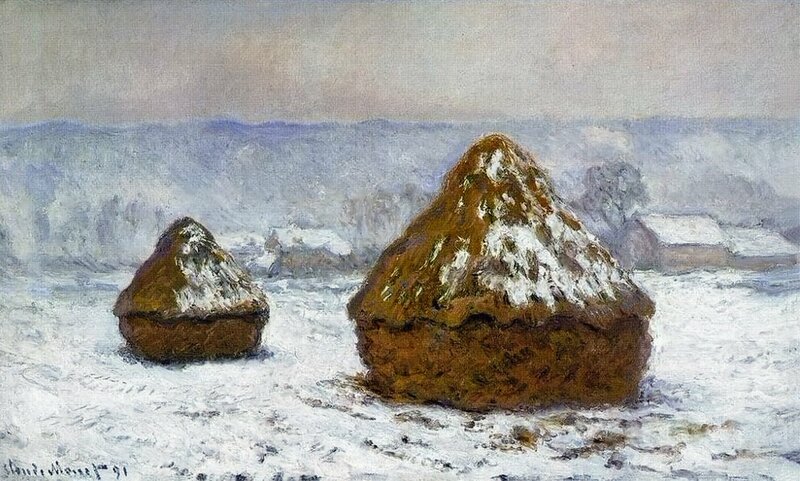 As a result, his willing helper was quickly carting as many canvases as a wheelbarrow could hold. 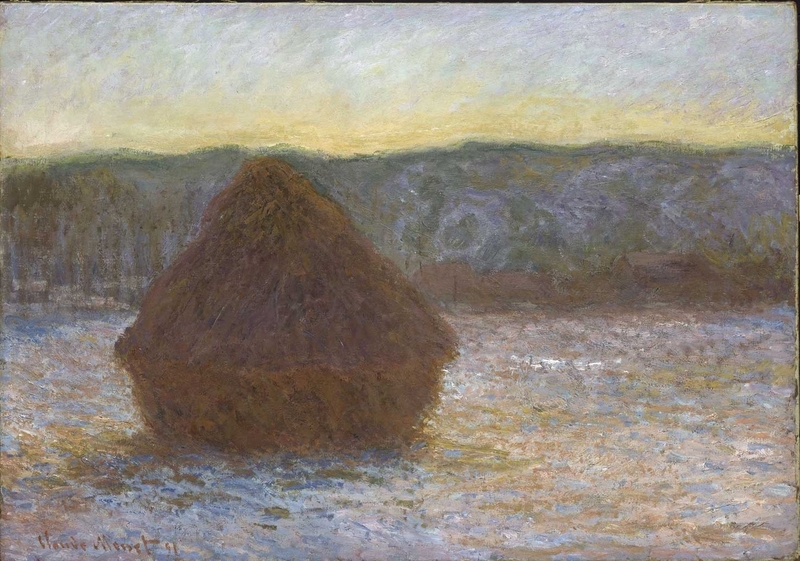 His daily routine involved carting paints, easels, and many unfinished canvases and working on whichever canvas most closely resembled the scene of the moment as conditions fluctuated. Although he began painting realistic depictions en plein air, he eventually revised initial effects in a studio to both generate contrast and preserve the harmony within the series. 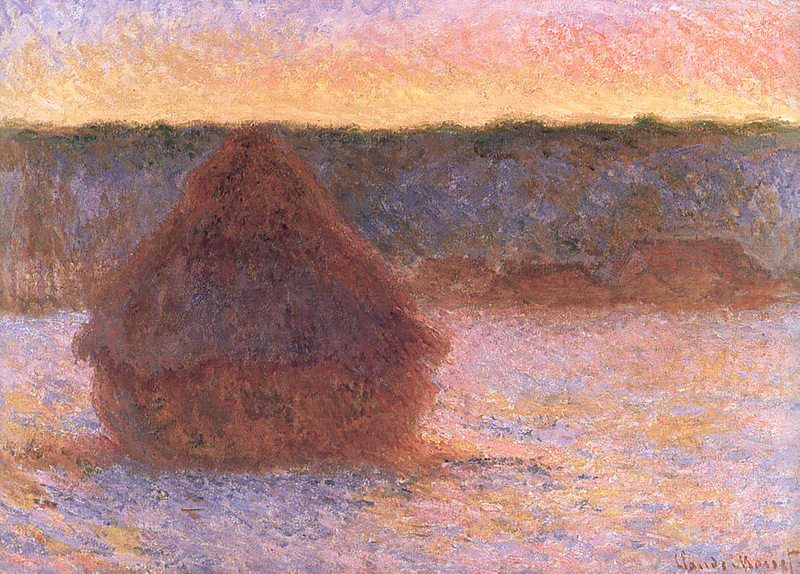 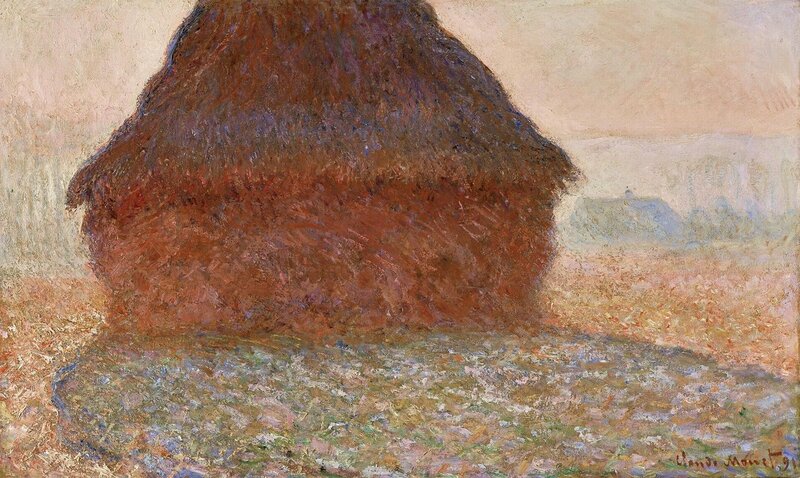 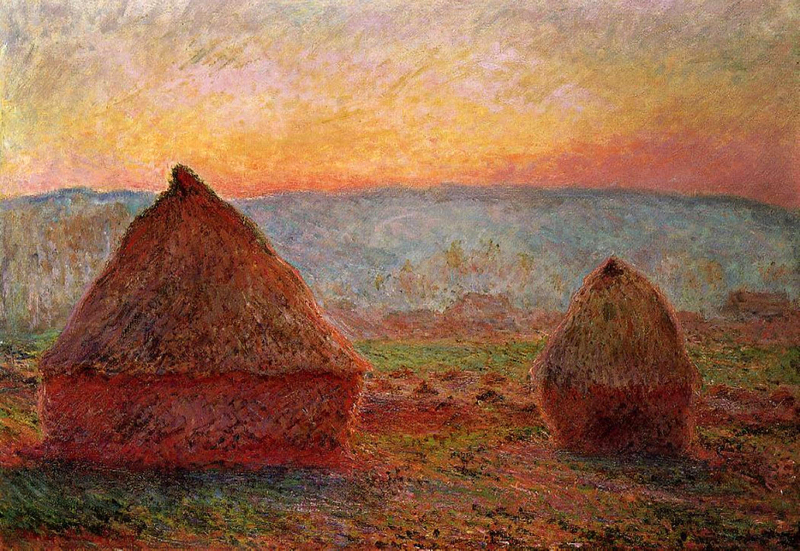 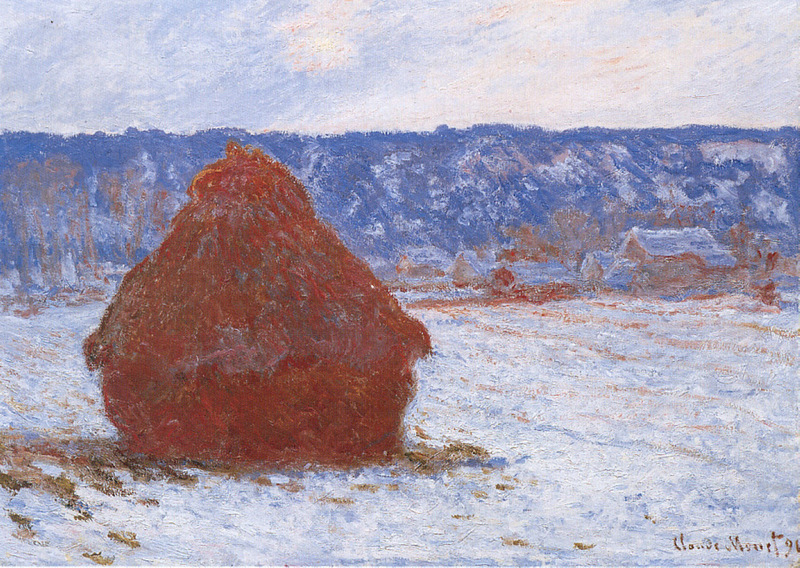 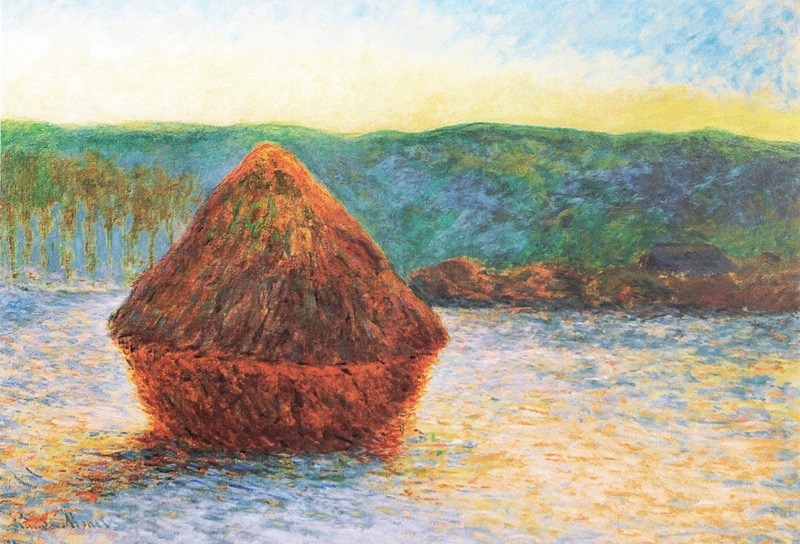 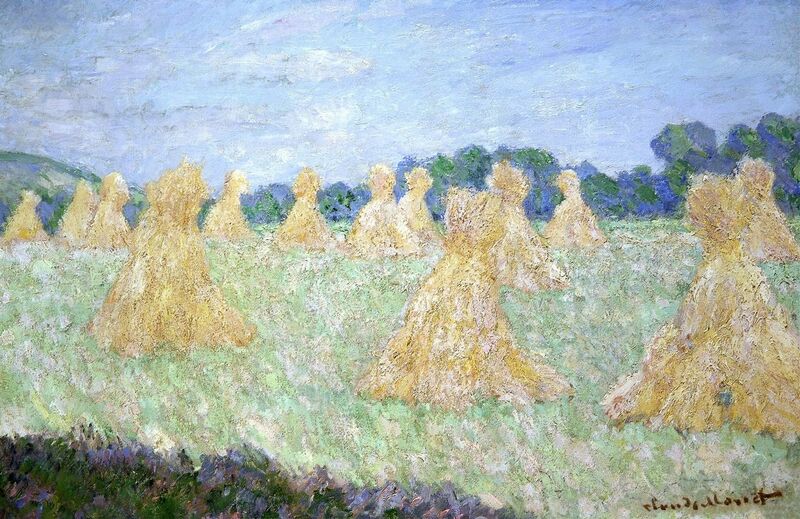 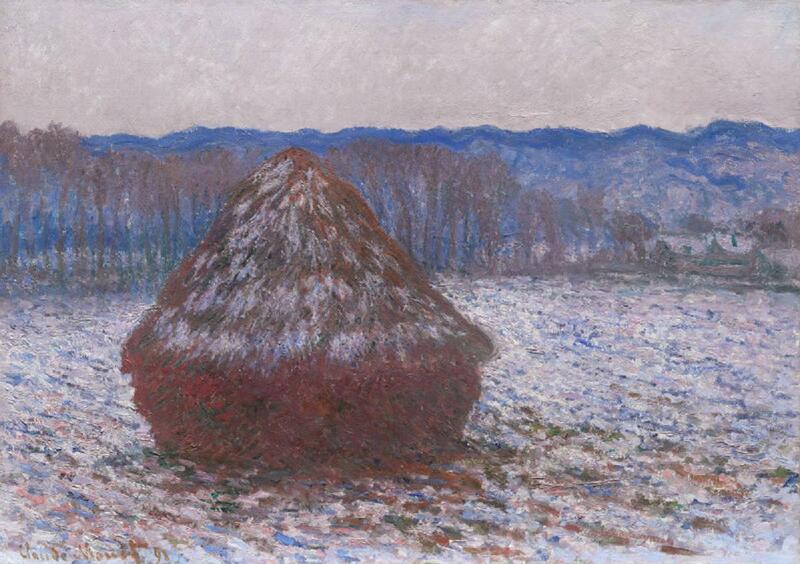 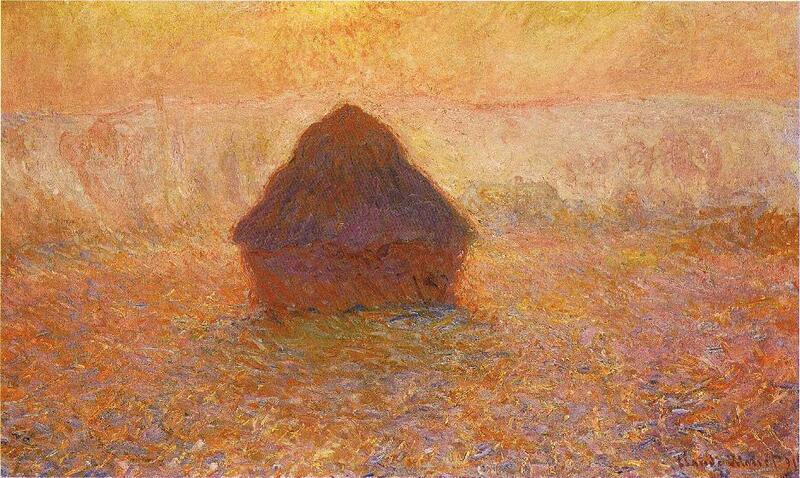 Monet produced numerous Haystack paintings. 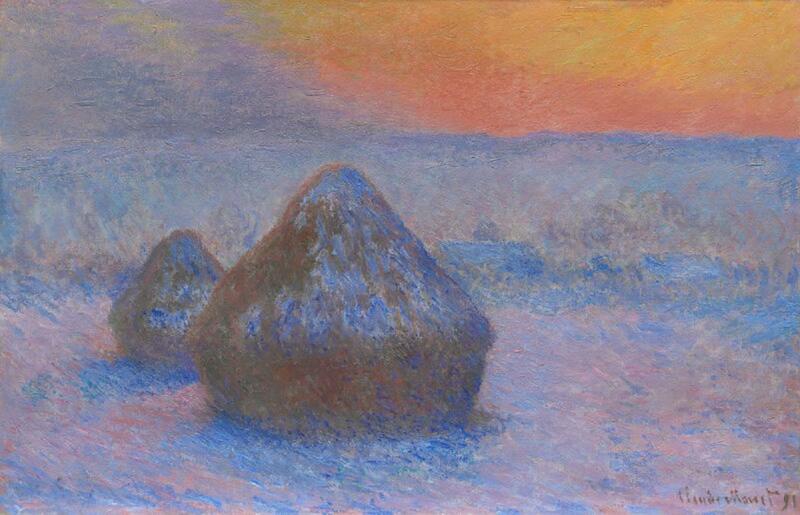 His earlier landscapes (Wildenstein Index Number 900-995, 1073) had included haystacks in an ancillary manner. 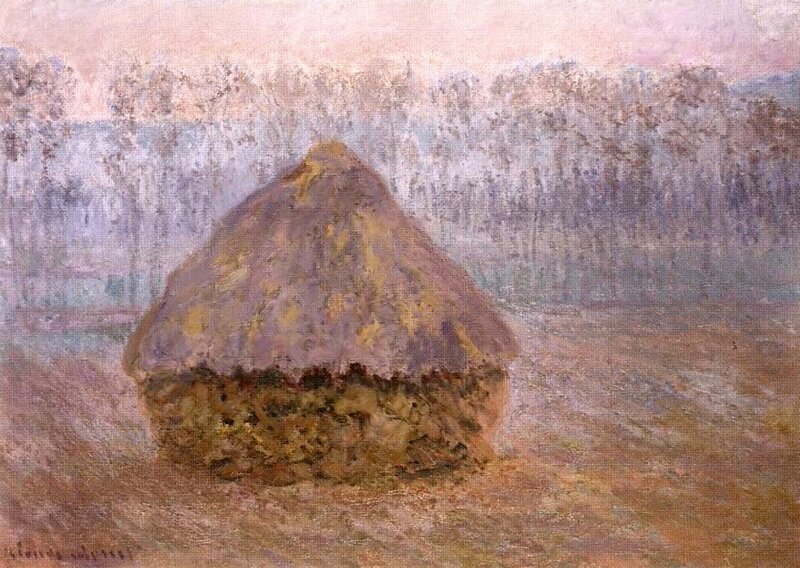 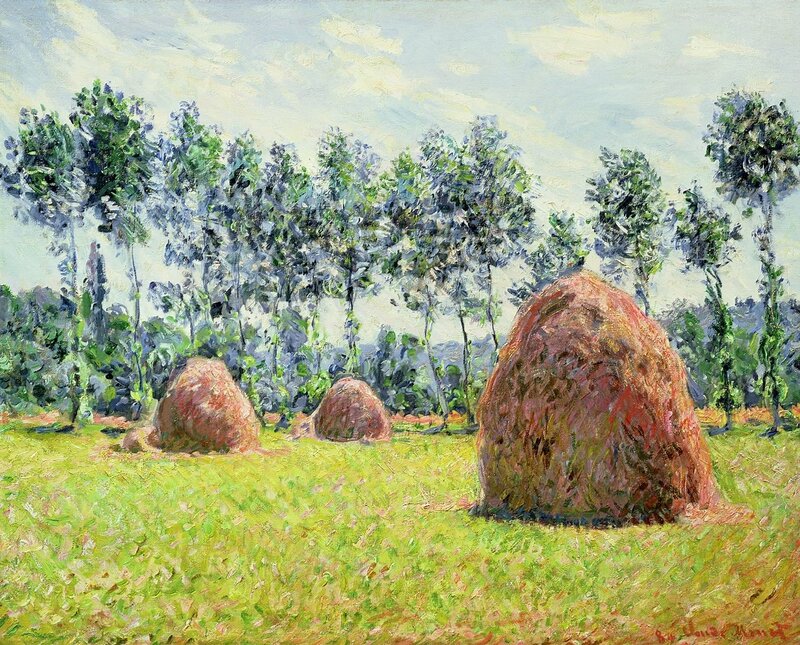 Monet had also produced five paintings (Wildenstein Index Numbers 1213-1217) with haystacks as the primary subject during the 1888 harvest. 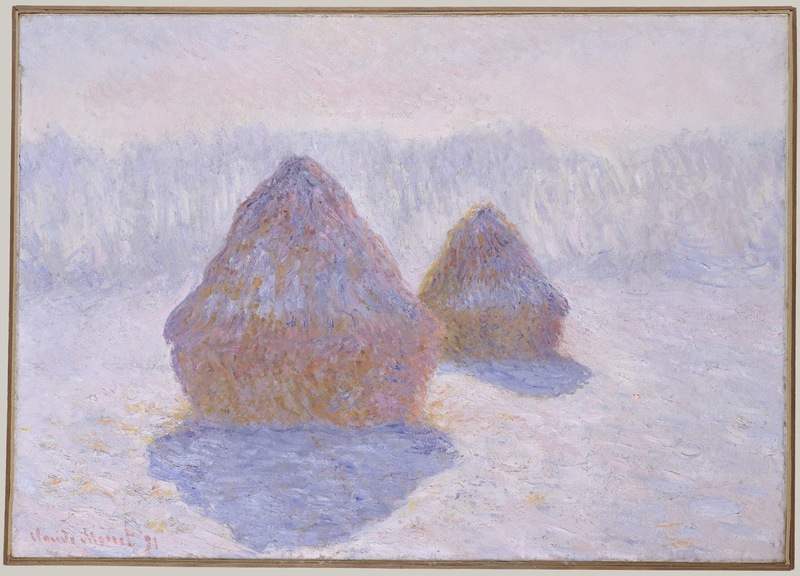 The general consensus is that only the canvases produced using the 1890 harvest (Wildenstein Index Number 1266-1290) comprise the haystacks series proper. 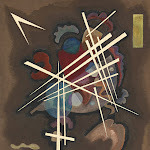 However, some include several additional paintings when referencing this series. 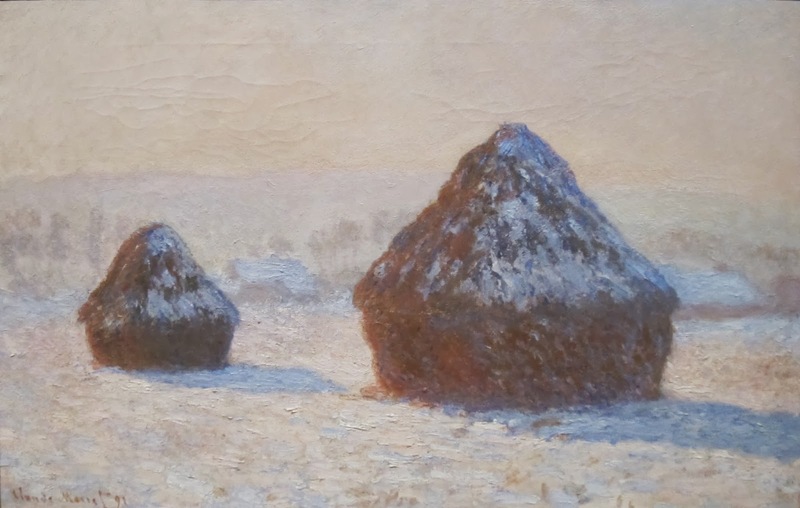 For example, Hill-Stead Museum discusses their two serial haystack or grainstack paintings even though one is from the 1890 harvest and the other is from the 1888 harvest. Although the mundane subject was constant throughout this series, the underlying theme may be seen as the transience of light. 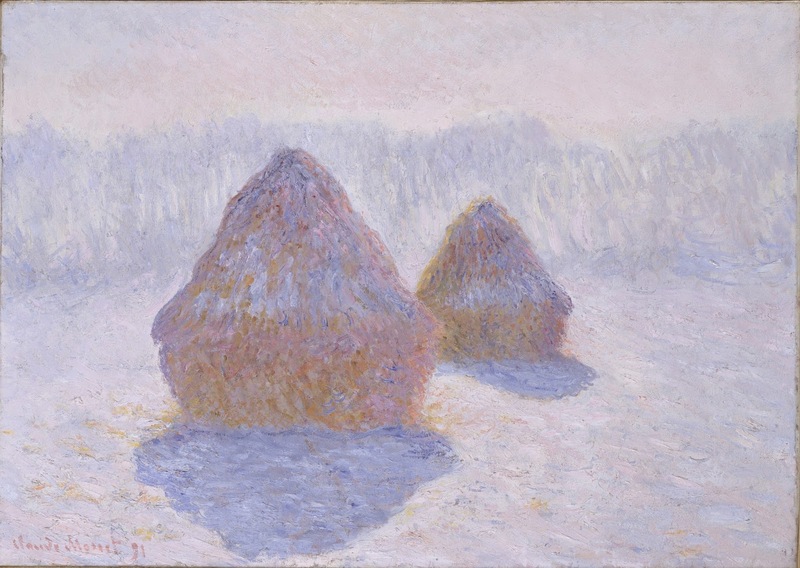 This concept enabled him to use repetition to show nuances of perception as seasons, time of day, and weather changes. 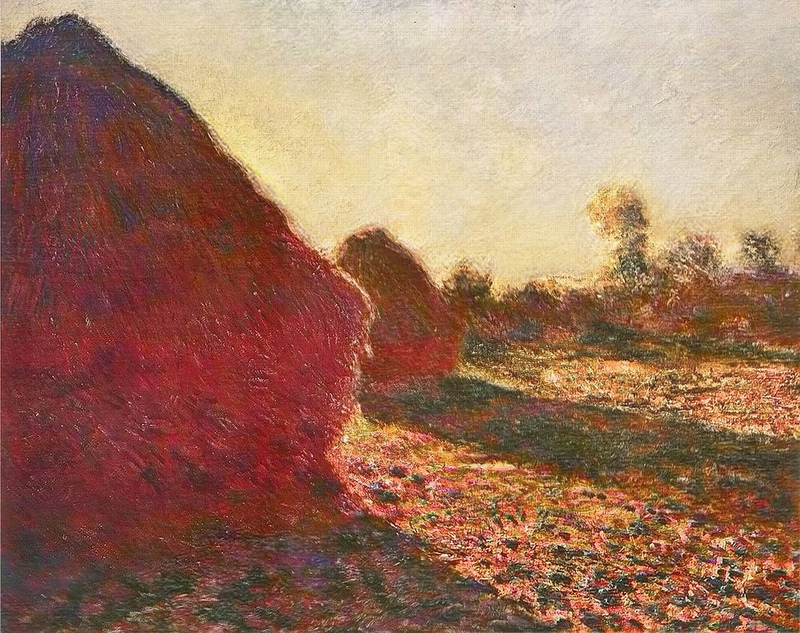 The constant subject provided the basis from which comparisons could be made in changes of light across this nuanced series. 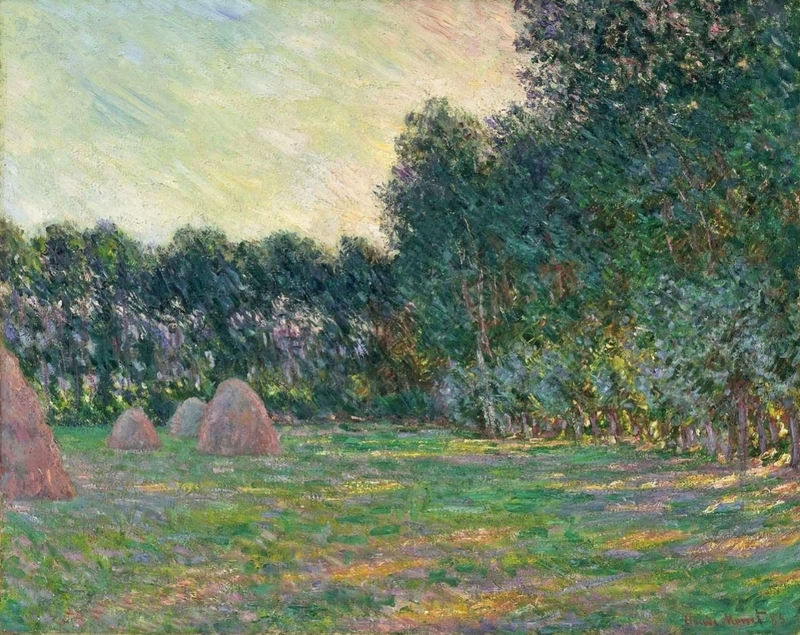 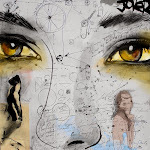 The first paintings in the series were started in late September or early October 1890, and he continued producing these paintings for about seven months. 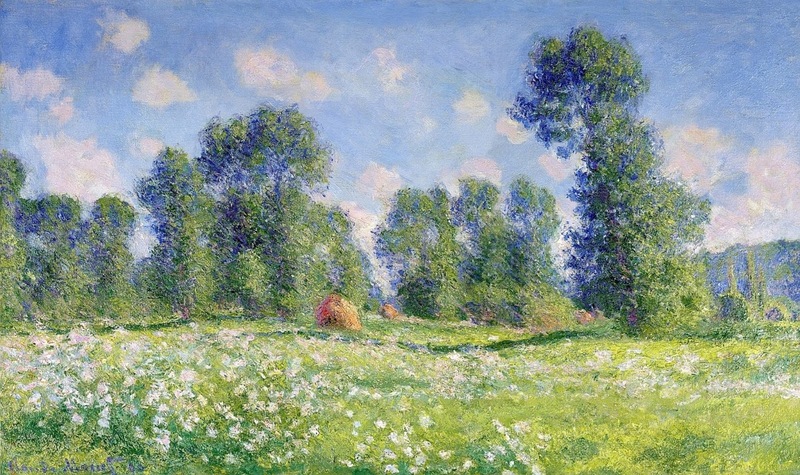 These paintings made Monet the first painter to paint such a large quantity of pictures of the same subject matter differentiated by light, weather, atmosphere and perspective.
" 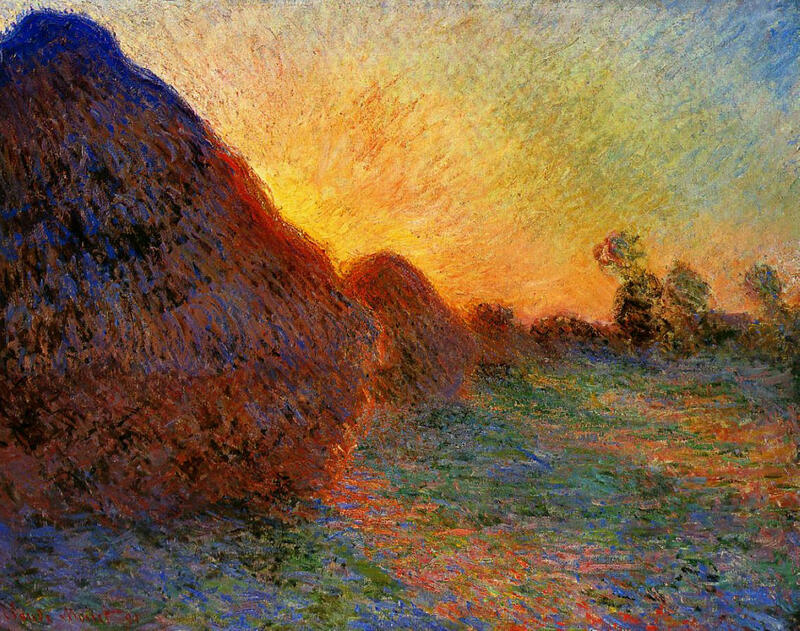 ...for the Early Mornings on the Seine series, he chose to paint at and before dawn, which made it 'an easier subject and simpler lighting than usual', because at this time of day the effects did not change so rapidly; however, this involved him getting up at 3:30 a.m., which seems to have been unprecedented even for so inveterate an early riser as Monet". 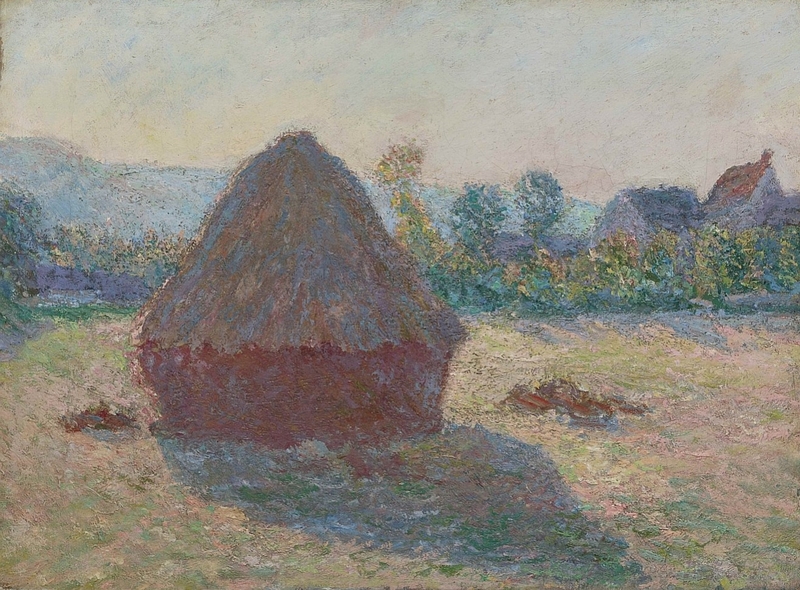 As the morning progressed and the light changed he would switch to sequentially later canvas settings, sometimes working on as many as ten or twelve paintings a day, each one depicting a slightly different aspect of light. The process would be repeated over the course of days, weeks, or months, depending on the weather and the progress of the paintings until they were completed. 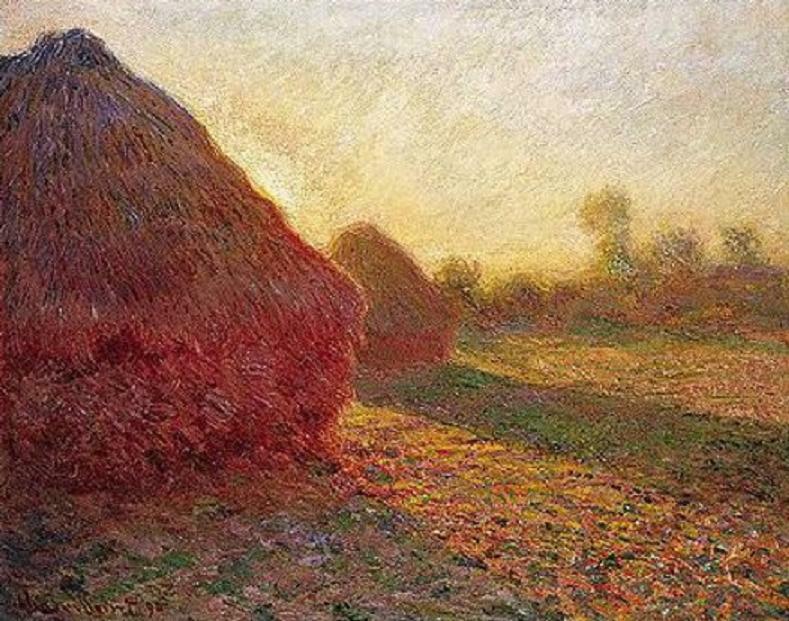 As the seasons changed the process was renewed. Certain effects of light only last for a few minutes, thus the canvases documenting such ephemera received attention for no more than a few minutes a day. 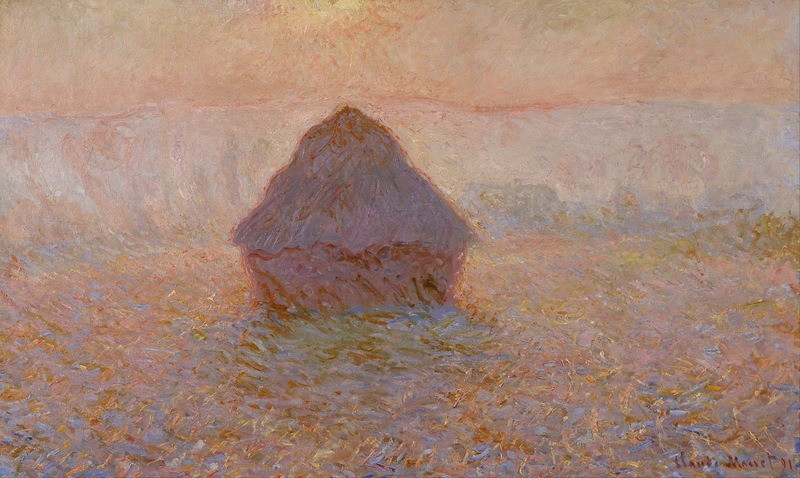 Further complicating matters, the light of subsequent sunrises, for example, could alter substantially and would require separate canvases within the series. 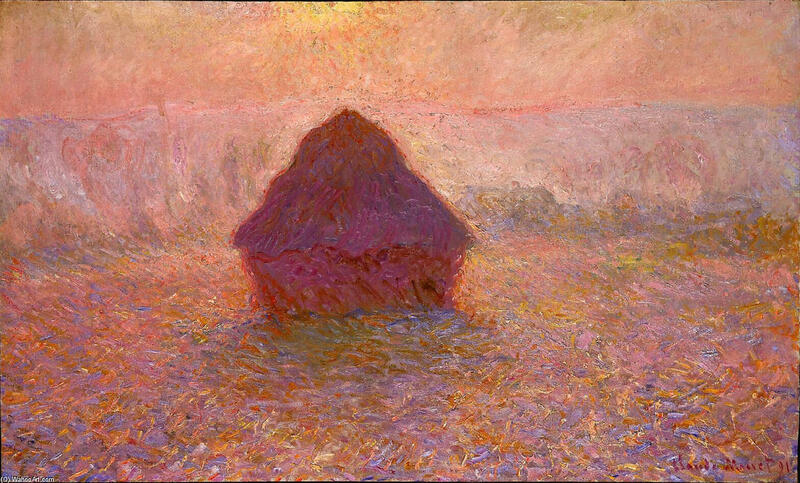 Subsequently, different hues are evident in each painting, and in each work, color is used to describe not only direct but reflected light. 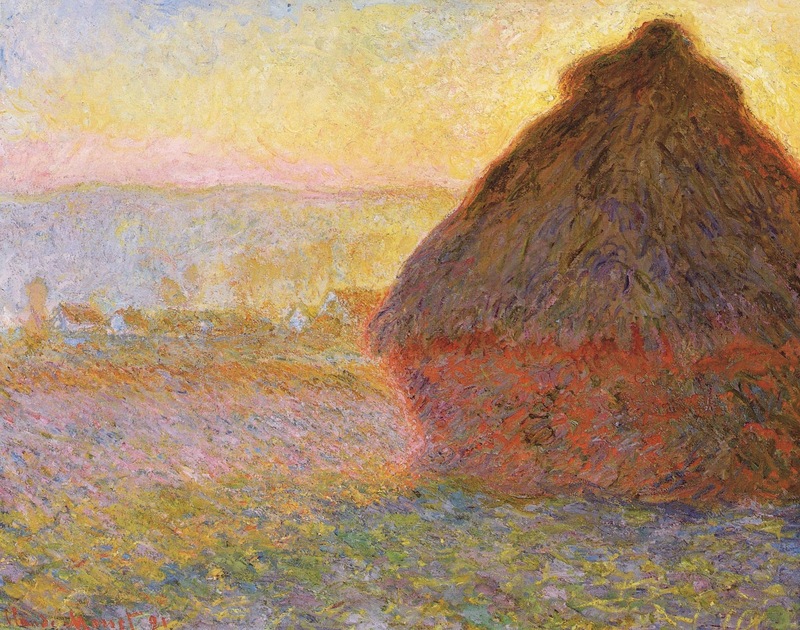 At differing times of day and in various seasons haystacks absorb the light from diverse parts of the color spectrum. 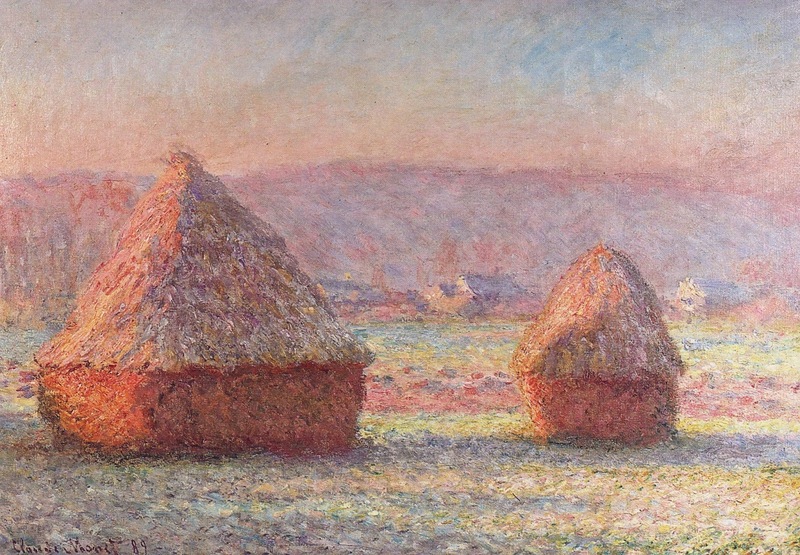 As a result, the residual light that is reflected off of the haystacks is seen as ever-changing, and manifests in distinctive coloring. 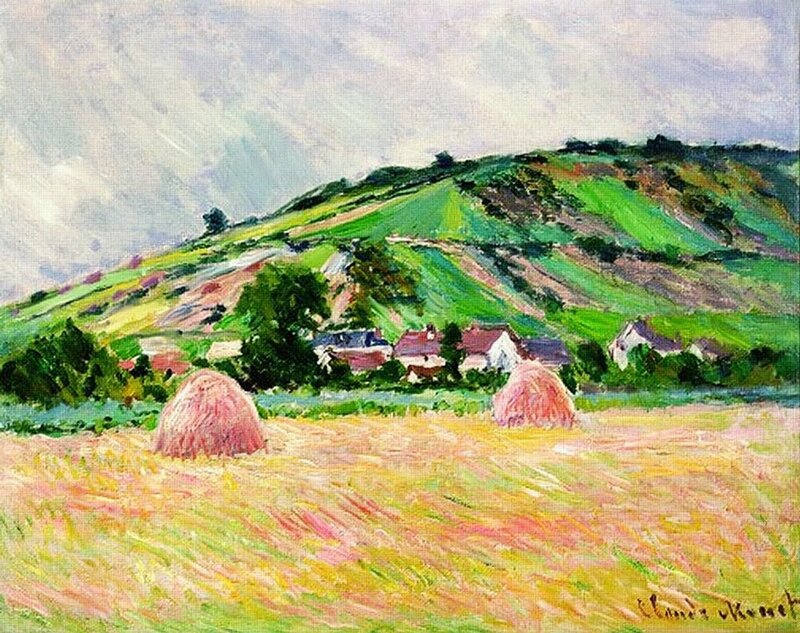 Many notable painters have been influenced by this particular series including Les Fauves, Derain and Vlaminck. 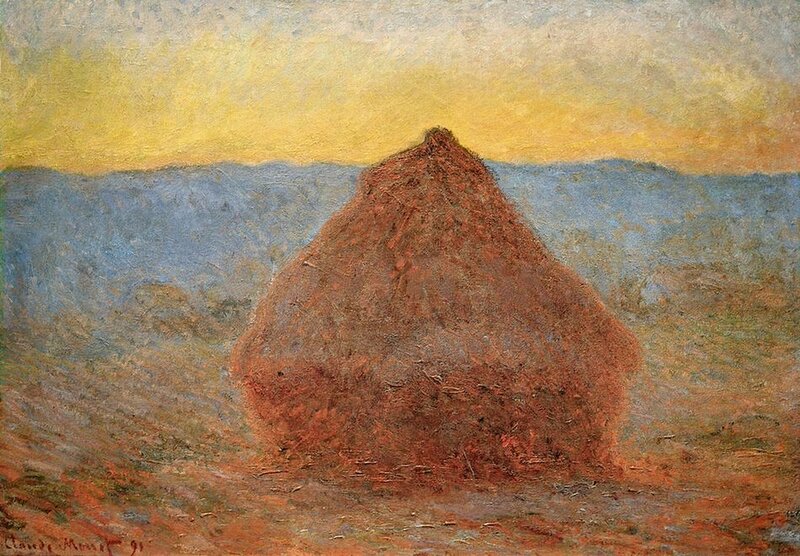 "What suddenly became clear to me was the unsuspected power of the palette, which I had not understood before and which surpassed my wildest dreams". 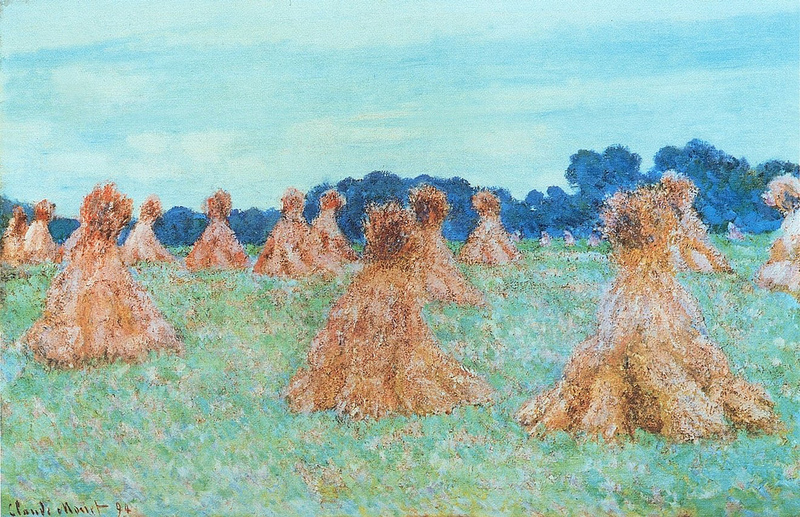 The Haystacks series was a financial success. 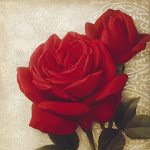 Fifteen of these were exhibited by Durand-Ruel in May 1891, and every painting sold within days. 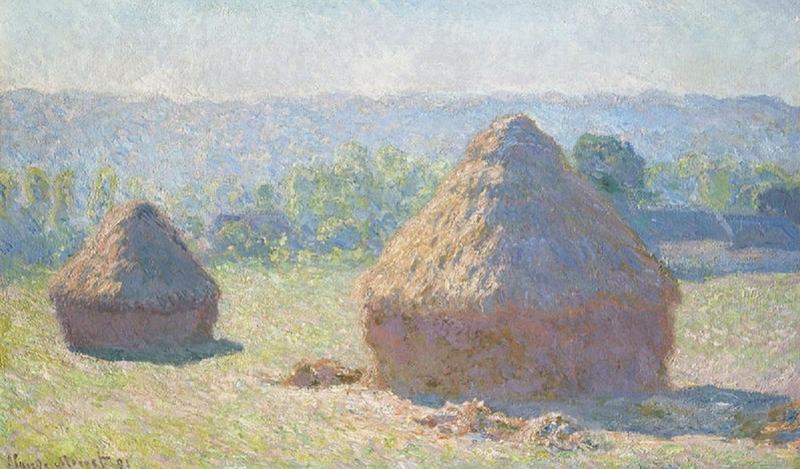 The exhibit met with great public acclaim. 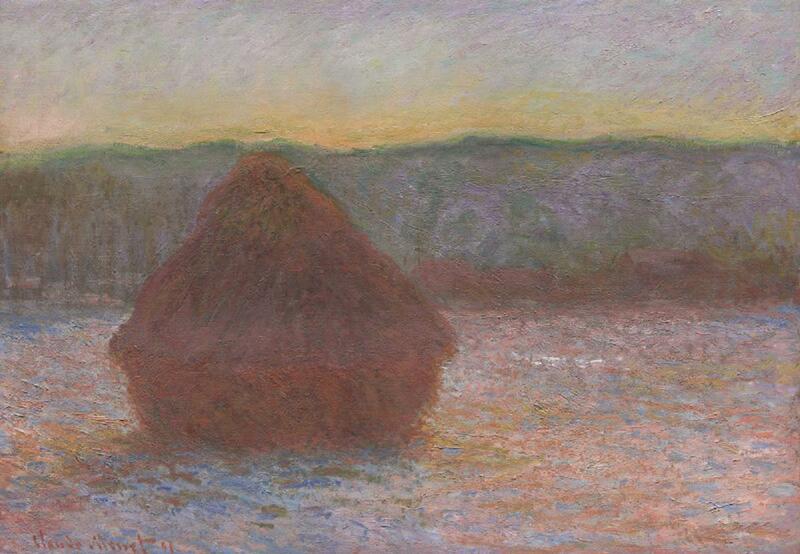 Octave Mirbeau described Monet's daring series as representing "what lies beyond progress itself". 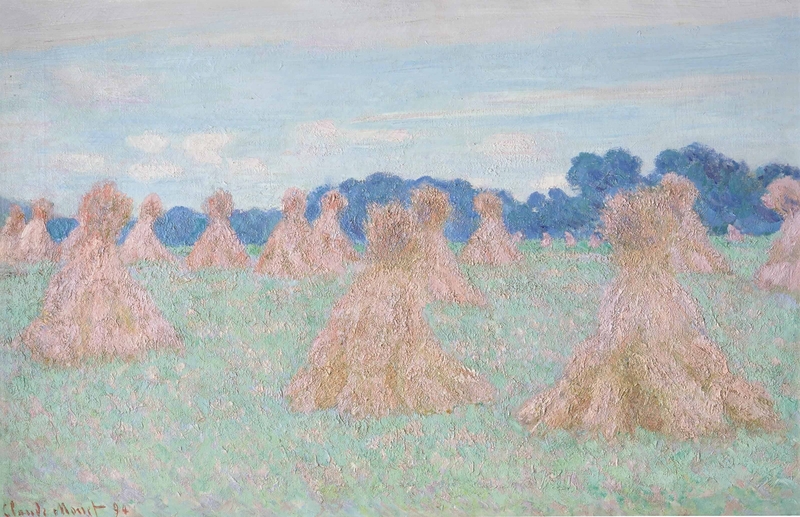 Others described the grainstacks as "faces of the landscape", and viewers seemed to take assurance that the series would help preserve rural traditions despite industrialization and urbanization. 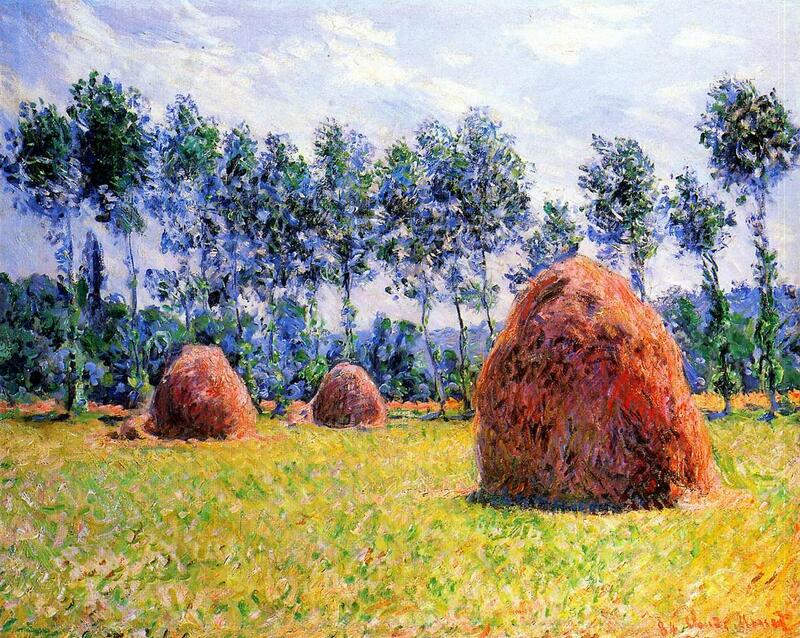 They represented the countryside as a retreat from daily problems and home for contentment with nature. 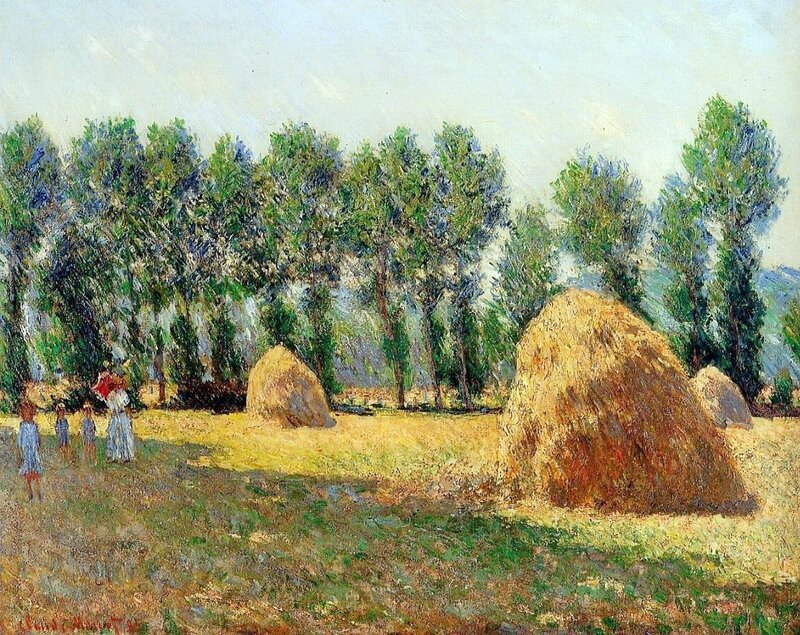 Camille Pissarro* said: "These canvases breathe contentment". 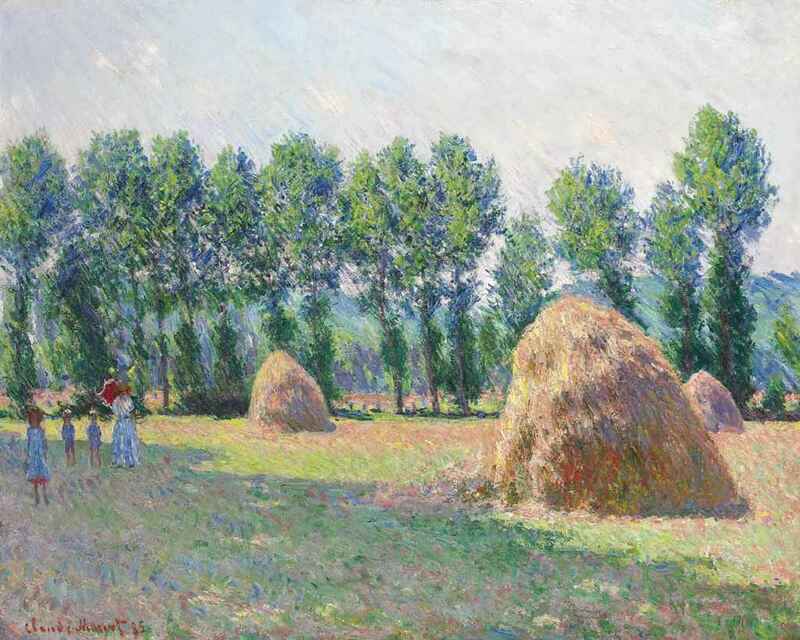 Most of the paintings sold immediately for as much as 1,000 francs. 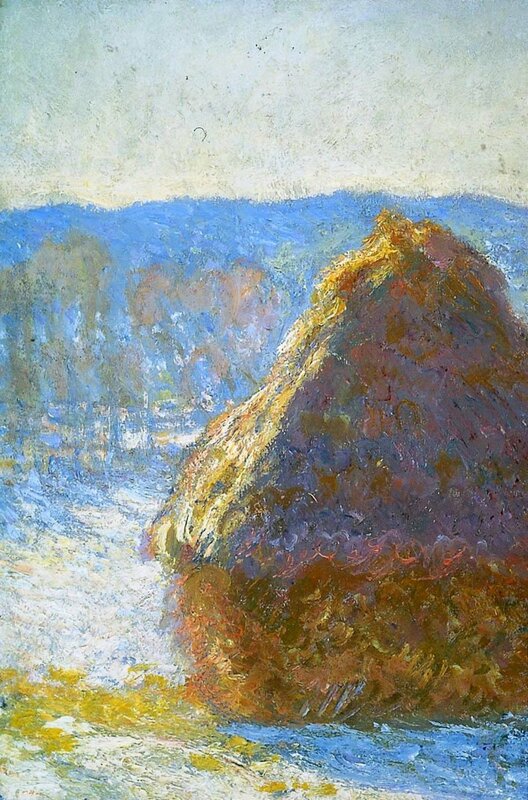 Additionally, Monet’s prices, in general, began to rise steeply. 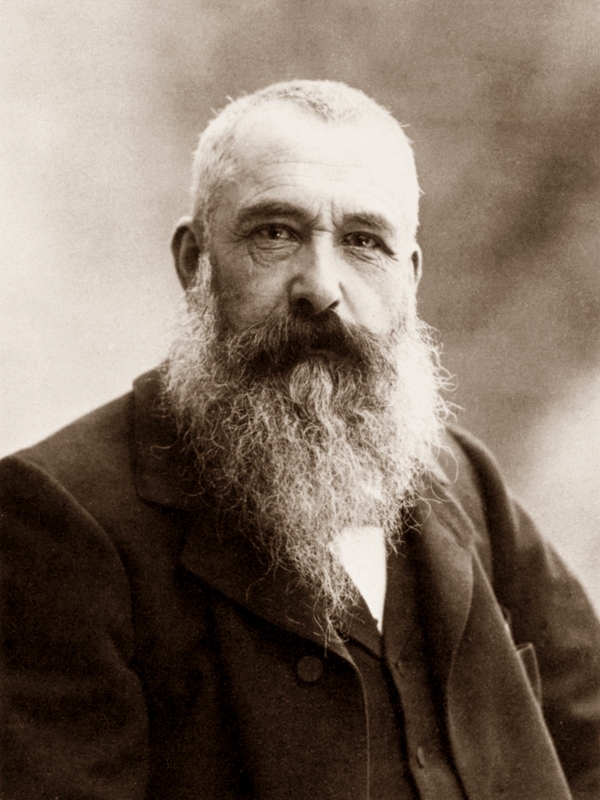 As a result, he was able to buy outright the house and grounds at Giverny and to start constructing a waterlily pond. 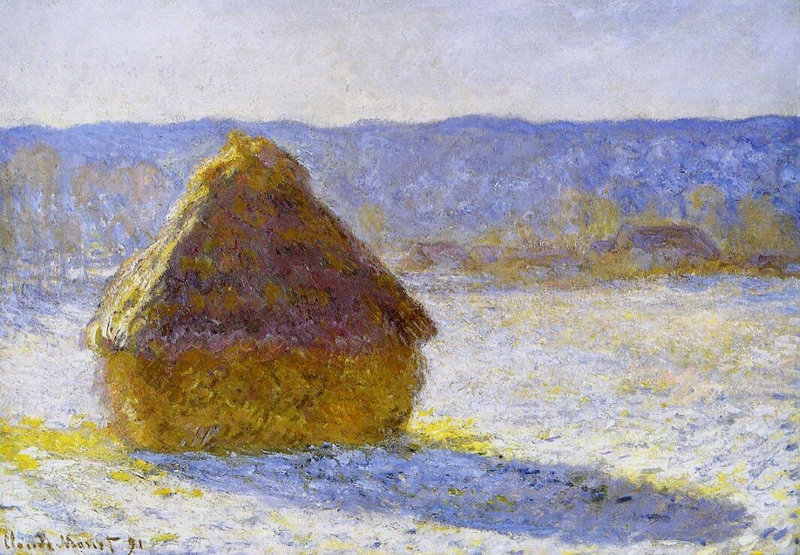 After years of mere subsistence living, he was able to enjoy success. 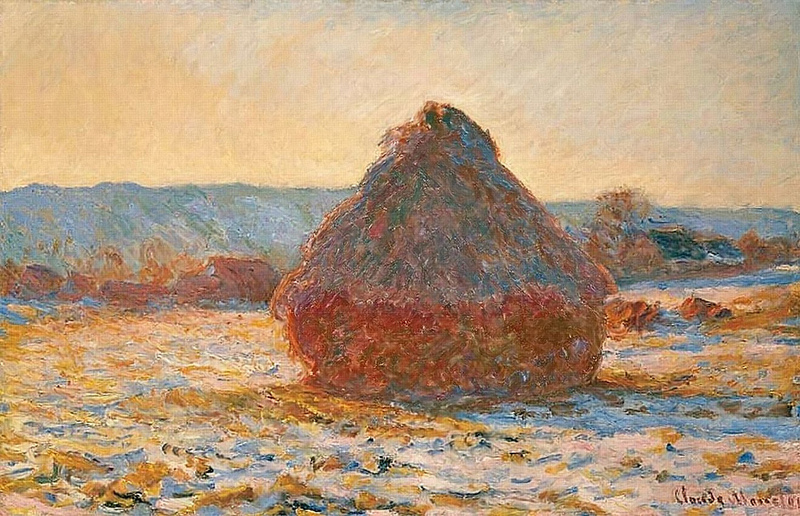 "Sgobbo molto, mi ostino su una serie di diversi effetti, ma in questo periodo il sole declina così rapidamente che non mi è possibile seguirlo, vedo che bisogna lavorare molto per riuscire a rendere quello che cerco: l'istantaneità, soprattutto l'involucro, la stessa luce diffusa ovunque, e più che mai le cose facili, venute di getto, mi disgustano". 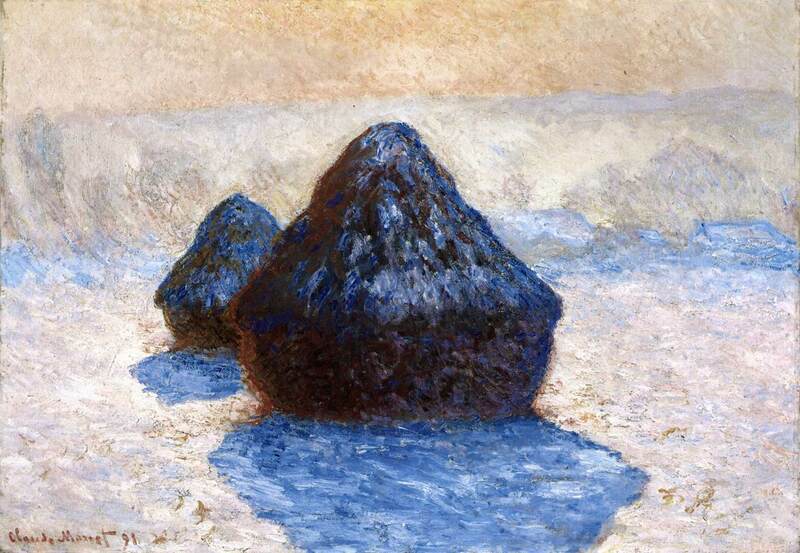 Difatti, nel 1889-1891, iniziò a dipingere la serie Meules - i Covoni, che rappresentavano il mutare della luce, delle stagioni e delle ore in soggetti e forme quasi elementari. 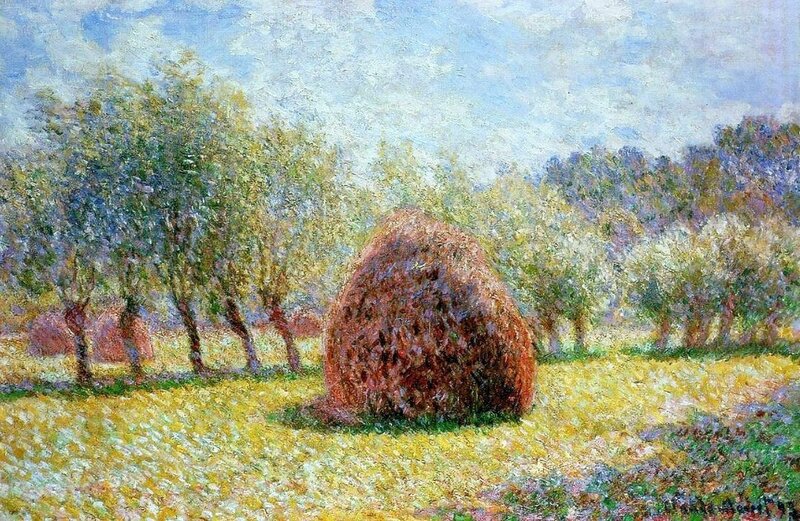 L'importante era il manifestarsi del proprio interesse verso l'irradiazione della luce. Esposta presso la Casa Durand-Ruel nel maggio del 1891, la serie dei Covoni ebbe successo e le tele vengono vendute da Monet direttamente ai collezionisti.